Nina's Coffee Cafe is everything you want a neighborhood coffee shop to be: welcoming, homely, spacious, plenty of personality and a great cup of joe. Located on the corner of Selby Avenue and Western Avenue in the Summit Hill area of St. Paul. The Blair Arcade has a parking lot, the entrance is on Selby Avenue. Two hour on-street parking is available outside. There's a bit of debate locally over whether the name of this coffee shop is pronounced Nee-nah, or if it's Ney-nah. We can't ask Nina herself. Nina's Coffee Cafe is named for madame Nina Clifford who ran a secret brothel nearby in the late 19th century. It's rumored that her establishment was connected by underground tunnels to the Minnesota Club, an exclusive gentleman's club frequented by St Paul's founding fathers. Interestingly, a street nearby is called Nina Avenue. Perhaps one of the patrons of the Minnesota Club was also the neighborhood's street planner? Whether the rumors are true, it's a good story. And despite the name, the most illegal thing at present day Nina's is how good the hot chocolate is. The coffee is organic, the baked goods are homemade, and they have a small food menu, with emphasis on breakfast items and sandwiches. The location is as good as the drinks. 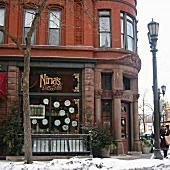 Nina's is on the first floor of the Blair Arcade building, a former Victorian hotel in St. Paul's Summit Hill[link]. It's a large space for a coffee shop, with a high ceiling, picture windows, exposed brickwork, and local artist's work on the walls. There's lots of couches and cozy seating areas, the front door has piles of free newspapers and they provide free wi-fi and plenty of electrical outlets to get hooked up and settled in. Directly downstairs from Nina's is Common Good Books, who host literay events in conjunction with Nina's, and becasue a good book and a good coffee go together so well. Nina's is a place that always seems to be humming, but it never seems too crowded. If you need caffeine to complete your college assignments, want a place to hang out and read a book, or just watch the people come and go, Nina's Coffee Cafe is a great spot.